Asbestos Awareness courses will build awareness and develop knowledge of the hazards and risks posed by asbestos containing materials (ACM’s) within their everyday working environment. It also offers an overview of the legislative measures in place to safeguard workers. The Control of Asbestos Regulations 2012 apply to employers, employees, self employed persons and duty holders and cover all work with asbestos containing materials. Regulation 10 of CAR states that every employer must ensure that adequate information, instruction and training is given to employees who are liable to be exposed to asbestos. This includes maintenance workers and others who may come into contact with or disturb asbestos. Our one -on-one tutor led e-learning courses are packed with all the information needed to meet all statutory training requirements and remain compliant. Live pictures, animated graphics and the personality of the presenter form part of a very effective virtual learning environment. Asbestos is probably the most dangerous building product ever used, it was widely used in the construction industry up until the year 2000. Asbestos causes serious ill-health to anybody who disturbs it. Anybody who works with asbestos or who is likely to needs to have an awareness of the correct health and safety procedures that need to be followed. Elite Personnel Training’s online Asbestos Awareness course is designed for anyone who may come into contact with asbestos in their work. The asbestos awareness course teaches you the different types of asbestos and risks involved with it. Also the course helps recognize the risks so any potential contact with asbestos can be avoided. The Asbestos Awareness course is accredited by the Royal Society for the Prevention of Accidents - RoSPA and the certificate will show the accreditation byThe Independent Asbestos Training Providers IATP. Anyone who may come into contact with asbestos in their work (builders, plumbers, electricians and cable layers, heating and ventilation engineers, carpenters, roofing contractors, shop and gas fitters, painters, decorators, plasterers, telecommunications and computers installers and engineers and other building related and maintenance trades). People wishing to develop knowledge and understanding to enable them to recognise asbestos and avoid the risks from asbestos. 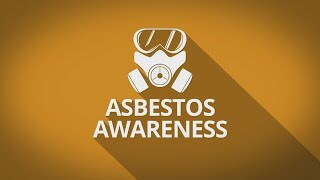 Asbestos Awareness courses are for people who work in a building that contains or may contain asbestos, you must complete Asbestos Awareness training.